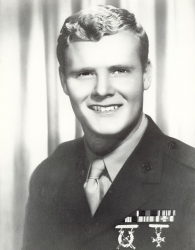 Sergeant Lawrence David Peters (16 September 1946 - 4 September 1967) was a U.S. Marine who was posthumously awarded the Medal of Honor for his heroic actions on 4 September 1967, during the Vietnam War. Lawrence David Peters was born on 16 September 1946, in Johnson City, NY. He attended Benjamin Franklin Elementary and Junior High Schools in Binghamton, NY, and graduated from Binghamton North High School in 1964. While still in high school, he enlisted in the U.S. Marine Corps Reserve on 18 September 1963 and was assigned to the 48th Rifle Company, USMCR, Binghamton. In September 1964, he completed recruit training with the 1st Recruit Training Battalion, Recruit Training Regiment, Marine Corps Recruit Depot Parris Island, SC. In October, he completed individual combat training with the 1st Infantry Training Battalion, Marine Corps Base Camp Lejeune, NC; and advanced infantry combat training in December with the 2nd Infantry Training Battalion, at the same installation. Upon completion of his training, he returned to Binghamton, where he remained with the 48th Rifle Company until he was discharged to enlist in the Regular Marine Corps on 30 January 1966. He was promoted to Private First Class on 16 December 1964; to Lance Corporal on 1 July 1965; and to Corporal on 1 January 1966. 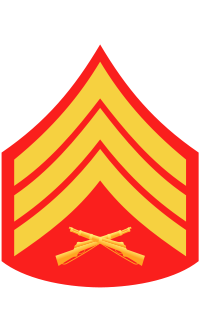 Corporal Peters requested assignment to Fleet Marine Forces, Pacific, and in March 1966, joined Staging Battalion, Marine Corps Base Camp Pendleton, CA, for transfer overseas. In May 1966, he joined Company D, 1st Battalion, 3rd Marines, 3rd Marine Division in the Republic of Vietnam, and served consecutively as fire team leader, squad leader, and non-commissioned officer in charge of the Combined Action Company. He was promoted to Sergeant on 1 September 1966. 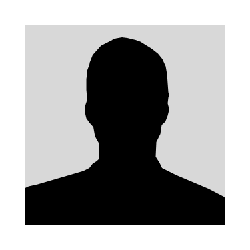 In November 1966, he served on temporary additional duty as company gunnery sergeant with Headquarters Company, 7th Engineer Battalion (Combined Action Company). That December, he was transferred to Combined Action Company, Sub Unit #1, Service Company, Headquarters Battalion, 1st Marine Division, where he served as non-commissioned officer in charge, until April 1967. He then served with the Military Police Company, attached to the 1st Marine Division, until the following July. Sergeant Peters next served as squad leader of Company M, 3rd Battalion, 5th Marines, 1st Marine Division. While serving in this capacity, on 4 September 1967, he was killed in action during Operation Swift in Quang Tin Province. For his "indomitable fighting spirit and determination against overwhelming odds," Sergeant Peters was posthumously awarded the Medal of Honor. For conspicuous gallantry and intrepidity at the risk of his life above and beyond the call of duty while serving as a Squad Leader with Company M, Third Battalion, Fifth Marines, First Marine Division in the Republic of Vietnam on 4 September 1967. During Operation SWIFT, in the province of Quang Tin, the Marines of the second platoon of Company M were struck by intense mortar, machine gun, and small arms fire from an entrenched enemy force. As the company rallied its forces, Sergeant Peters maneuvered his squad in an assault on an enemy defended knoll disregarding his safety, as enemy rounds hit all about him, he stood in the open, pointing out enemy positions until he was painfully wounded in the leg. Disregarding his wound he moved forward and continued to lead his men. As the enemy fire increased in accuracy and volume, his squad lost its momentum and was temporarily pinned down. Exposing himself to devastating enemy fire, he consolidated his position to render more effective fire. While directing the base of fire, he was wounded a second time in the face and neck from an exploding mortar round. As the enemy attempted to infiltrate the position of an adjacent platoon, Sergeant Peters stood erect in the full view of the enemy firing burst after burst forcing them to disclose their camouflaged positions. Sergeant Peters continued firing until he was critically wounded by a gunshot wound in his chest. Although unable to walk or stand, Sergeant Peters steadfastly continued to direct his squad in spite of two additional wounds, persisted in his efforts to encourage and supervise his men until; he lost consciousness and succumbed. Inspired by his selfless actions, the squad regained fire superiority and once again carried the assault to the enemy. By his outstanding valor, indomitable fighting spirit and tenacious determination in the face of overwhelming odds, Sergeant Peters upheld the highest traditions of the Marine Corps and the United States Naval Service. He gallantly gave his life for his country. Sergeant Peters' Medal of Honor was presented to his family by Vice-President Spiro Agnew on 20 April 1970. Lawrence David Peters' name is inscribed on Panel 25E - Line 108. Sergeant Lawrence David Peters was killed in action on 4 September 1967. He is buried at Chenango Valley Cemetery in Binghamton, NY.